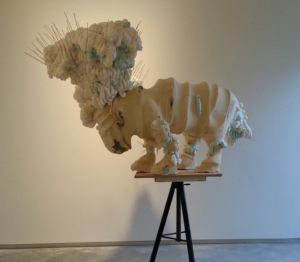 Tom Claassen creates sculptures with a humoristic wink to the imagined. His sculptures, ranging from rough to small to classical monumental, always include a motivational, witty look that makes the work so personal and accessible. By acting on our collective unconscious, he achieves a sense of naturality and self-evidence. This is also the case with Untitled (de Bok), Claassen’s sculpture of a goat, that is exhibited in the Front space of the gallery. De Bok wears a wig made from polyurethane foam and skewers, which evokes an estranging and unfinished effect. Apart from De Bok, Claassen also shows a work that resembles Venetian blinds or an insect screen, through which you must enter the gallery. The materiality and the cooperation of the two sculptures directly respond to the viewer’s senses and changes the experience of the space. The combination of the two works shows Claassen’s playful use of shape, space, size and material.